Apples weren’t my thing a couple of years ago. It was all a bit too predictable. You could tell the guy on the train who was going to get a Mac out of his laptop case – it was ‘a certain type.’ Now it seems I have become one of those types. It’s ok these days because every second person has an Apple product of one type or another. I’m hopeful that fact prevents me from being part of that once-predictable crowd. For me it started with a phone. I had two Blackberries over a period of two or three years and they served their purpose really well. I was a huge fan. Then one day, the whole RIM-outage-no-mobile-email-reboot-it-every-so-often thing just became too difficult. It turned out that in my job (for which mobile communication is important) having to do all those extra bits and pieces you have to do when you own a Blackberry, were getting in the way of actually doing my job. Landing in another country for a one day meeting and finding that I couldn’t pick up a local mobile phone provider signal and couldn’t get any email just wasn’t acceptable. The truth is not that there was anything desperately wrong with Blackberry. I’m still a huge fan of the physical keyboard – by the way, the original Bold 9000 had the best keyboard by a country mile. What changed was me. Doing email and making phone calls on the go is a by-product of what I do but an important one. As a result something like that getting in the way was just, well, getting in the way. So there’s Apple number two. Yes, number two. iPad came to me before iPhone in fact, as Apple number one, but since I had nothing to compare the iPad to, as much as I like it (and am writing this now on it at 38,000 feet) it didn’t dawn on me what the difference with Apple products was until the iPhone. It took me a while to get used to the iPhone over the Blackberry. Issues aside, I knew what I was doing with the Blackberry. I’d used them for so long day-in, day-out that I knew all the quirks and what had to be done when. Up to a point that worked, as noted. When I say it took me a while to get used to the iPhone, I’m talking a couple of days. There were a few ‘what is it trying to do now’ moments. I was trying to use it like a Blackberry – trying to impose the previous user experience on a new interface. The irony was instead of trying to learn what was going on, just becoming part of the experience and letting the thing guide me worked out fine. I’m as comfortable if not more so with the iPhone as I was previously with Blackberry. Apple number three was the Mac. Much like Blackberry I’d always had a Windows laptop. Ten plus years. Yes, they’re slow sometimes and get slower as they get older. Yes, there’s a bunch of stuff you just have to know to get it to work properly and so on, but it was comfortable and so I clung on to my Windows laptops – a fair number of them. But once again, as I changed and the work I was doing changed so my needs changed. The value to me now of a laptop that weighs almost nothing and is there when I need it, with no extended boot sequence and with plenty of battery life is greater than the comfort of previous machines. And yes, it is awfully pretty as well. They key to all of this for me, with all of these devices, is that they’re built to do one thing and do it well. 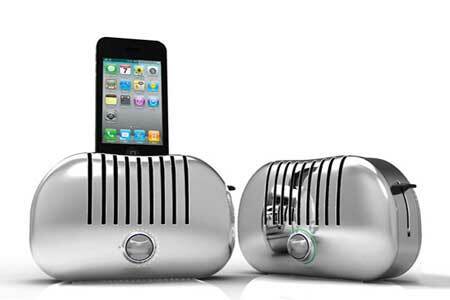 In the same way, if you want to toast bread you buy a toaster not a grill. Yes the grill may be able to do a load of other stuff as well, but all I need to do is toast bread. The toaster is an appliance built to do one thing, do it well, and not require any real knowledge or talent (not that I’m suggesting that making toast is complex you understand.) What I’ve been getting my head around recently is the difference between the toaster and the grill. What makes an appliance an appliance rather than a bunch of things thrown together in a effort to make life simpler. Apple seems to do it pretty well. It also seems that the toaster in our kitchen does it pretty well – rarely is there burnt toast. It’s about making it easier when what we’re trying to achieve is not the primary thing we do. My job isn’t doing email on the move but it is something I need to be able to do, therefore, iPhone. I don’t toast bread for a living either, therefore, toaster. You’ll know by now in this blog that I’m getting to the bit I do actually do – backup. More specifically backup appliances and more specifically still, Backup Exec Appliances. Not just a bunch of stuff we’ve thrown together in a box. Built specifically to do one job and do it well. Serving a purpose. Because if your primary job is doing backups every day, what else could you be doing more usefully if backups were easier to do. And if your primary job isn’t doing backups every day then you surely want ‘doing backups’ to be as straightforward and worry-free as possible, don’t you? So there it is; Backup Exec Appliances – rather like Apples and Toasters . . . ripe now and cooked just right.